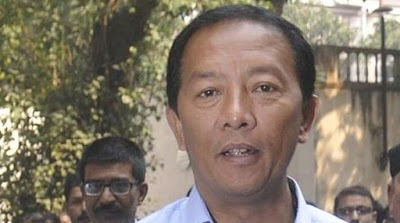 Gorkha Jan Mukti Morcha leader Binoy Tamang on Friday condemned statements made by Darjeeling MP SS Ahluwalia in Siliguri on Thursday, and he alleged the recent Gorkhaland agitation that the Hills saw was scripted in New Delhi. “The Darjeeling MP said a conspiracy was being hatched to murder Morcha leader Bimal Gurung, and he further said he would save him and give him security. But we would like to question him this~where was he when the Hills went through a 104-day shutdown and people faced a lot of problems and they were not secure?” Mr Tamang said in a release. “When people were getting killed here, why did he not utter a word? We take this chance to advise him that he is not the MP for Gurung only, but for the entire people here. As such, he should provide security not only to Gurung, but all the people here,” he added. “The script for the recent undemocratic agitation was written in Delhi. It was under the BJP government’s direction that Gurung announced the agitation. That is the reason why the MP who was sitting in Delhi till now is speaking in favour of Gurung after eight months. The BJP wants to create disturbance in the hills and bring Gurung to the hills before the 2019 elections,” said Mr Tamang. He further wondered what happened to the dreams of the Gorkhas being the BJP’s dream, or the assurance to look into the demand of the Gorkhas and Adivasis sympathetically, and also a committee to examine the demand for Gorkhaland that was promised. “It was under the direction of the BJP government that Ahluwalia had said they would hold an official meeting for Gorkhaland if the strike was withdrawn, but no such thing has happened till now,” Mr Tamang, who is also the chairman of the Gorkhaland Territorial Administration board, said. “Though the Hills gave two MPs to the BJP, what did they do for the people here in the past 10 years? They only betrayed the people here. This has to be answered by the MP before he heads for the hills,” Mr Tamang said. The press release alleges that Mr Ahluwalia showed his “negative sentiment” towards the hills, when he remarked he became the MP not only from the votes of the hills, but also areas like Siliguri, Matigara, Islampur and Chopra in the plains.